Eagles' head coach Doug Pederson (left) will have to overcome losing his offensive coordinator, Frank Reich. What's going to be the biggest obstacle? Would it be the loss of LeGarrette Blount, the top running back? The loss of tight end Trey Burton, who threw the Philly Special pass? Not even close. The Eagles got multi-back Darren Sproles back and they drafted tight end Dallas Goedert in the second round. The biggest obstacle won't be on the field. It will be on the sidelines, in the meeting rooms, and on the practice fields. It will be overcoming the departures of offensive coordinator Frank Reich and quarterbacks coach John DeFilippo. In fact, the assemblage of players who kick off the season Thursday against Atlanta is appreciably better than the team that beat the Falcons, then the Vikings, then the Patriots and won the franchise's first Lombardi Trophy in 52 tries. That will be true even though Carson Wentz and Alshon Jeffery are still recovering from their surgeries. Will the assemblage of coaches be as good? That will take some doing. In Reich and DeFilippo the Eagles lost a pair of quick-turnaround magicians who can tailor their teaching style to any type of player and can tailor their scheme to any personnel. In two years, along with head coach Doug Pederson, they cleaned up Chip Kelly's mess and created a Super Bowl champion that scored 41 points in the big game — with its backup quarterback. Reich finally got a head coaching job with the Colts in February. He drew interest from the Titans and Bills in the past. The Vikings hired DeFilippo as their offensive coordinator one year after the Eagles denied the Jets the chance to interview him for the same position. The other coaches are Mike Groh, promoted from receivers coach to coordinator, and Press Taylor, a quality-control holdover from Chip Kelly's staff whom Pederson promoted to be the assistant quarterbacks coach the last two seasons. Groh's first-team offense produced zero points in the preseason. Taylor's starting quarterback this preseason, Nick Foles — the Super Bowl MVP — finished with a 48.7 passer rating. Ignore those results, said right tackle Lane Johnson. "Mike and all those guys have done a great job. It's all about us getting our players back," Johnson said. "We've got seven guys out." Carson Wentz enters his third season without quarterbacks coach John DeFilippo. Johnson referred to Wentz, Jeffery, left tackle Jason Peters, running backs Darren Sproles and Jay Ajayi, who have all gone to at least one Pro Bowl, as well as slot receiver Nelson Agholor and running back Corey Clement, who led the team's running backs with four rushing touchdowns and caught a TD pass in the Super Bowl. Reich and DeFilippo might be gone, but Pederson remains. Pederson always was involved with game-planning and quarterback coaching. Pederson calls the plays in the game. But Reich served as more than a right-hand man, said several Eagles players. Reich is familiar with the league's defensive coordinators and their favored schemes. Reich recognizes the strengths and weaknesses of the league's better defensive players. Reich served as a stabilizing force in the demanding Philadelphia football market. 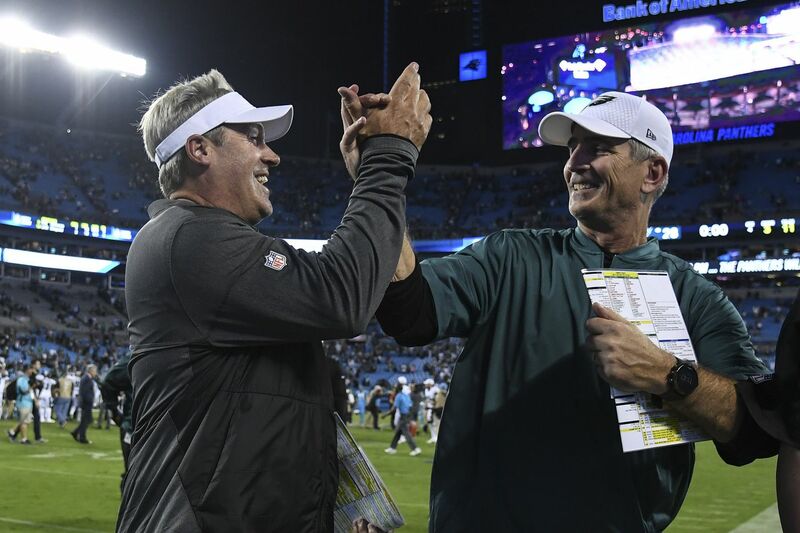 Pederson defended the offense's preseason shortcomings by pointing out that, in game-planning for the preseason games, the team didn't employ its usual recipe of play calls and designs. This defense causes concern on two fronts: First, the Eagles couldn't execute the simple stuff; and second, the chief planners and designers were Reich and DeFilippo. Don't worry, Johnson said. Offensive line coach Jeff Stoutland remains as a link to the recent past. "Anything we may lack, we've got Stoutland. He's so good at helping with game-planning," Johnson said. "When we go into meetings, it's kind of, like, him conducting — him and Groh — going back and forth. It was the same way with Frank. They worked well together. Whenever he's in the room, I don't feel any concern." It isn't unusual for an offensive-line coach to play a major part in game plans, since he's responsible for the intricate protections and run-blocking assignments that make every offense work, and Stout is among the best in the business. But moving an offense forward takes more than an O-line coach, and the O-line coach didn't perform the incredible amount of teaching and implementation Reich and DeFilippo performed the last two seasons. The first time Reich saw Wentz's college tape, from FCS (I-AA) North Dakota State, he classified Wentz as a franchise quarterback who could immediately start in the NFL. He was responsible for every step of Wentz's development over the next two seasons. DeFilippo helped conceive those plans, and DeFilippo put them into effect on the practice field. Reich and DeFilippo also revived the career of Foles last season, and did so even though Foles missed the 2017 preseason with a strained flexor tendon in his right elbow. When Wentz's knee collapsed Dec. 10 against the Chargers, Foles was ready to go. Within a couple of weeks Reich had reconfigured the offense to accentuate Foles' strengths: shotgun formations, deception, quick throws. And that's only half the story. For all of the attention given the Eagles' passers and their passing game, Reich's offense ran the ball. It ranked third in the NFL in both yards and rushing attempts. Incredibly, it involved six running backs, and did so extensively. Wentz's runs helped, but the Birds still would have been in the top half of the league without his 299 yards, and Wentz didn't play the last three games. Still, Reich spent the most time with his passers, and, in a unique coach-player dynamic, Reich connected with his Jesus-quoting quarterbacks on a spiritual level. Throughout the offense his leadership largely spared the rod. "Frank's a special guy. So smart. He has a presence about him. He was a pastor," Johnson said. "He loves that old-school mentality. He had a good way to motivate people without saying the wrong thing. Real smooth at what he does." Maybe Groh will be just as smooth. Maybe Taylor will be just as effective as DeFilippo. In the final days of the preseason Wentz has looked sharp, strong, and mechanically smooth. Besides, it was Taylor who unearthed and refined the Philly Special, the trick play that gut-punched the Patriots in the Super Bowl. Then again, it was Reich who told Taylor to go out and find it.